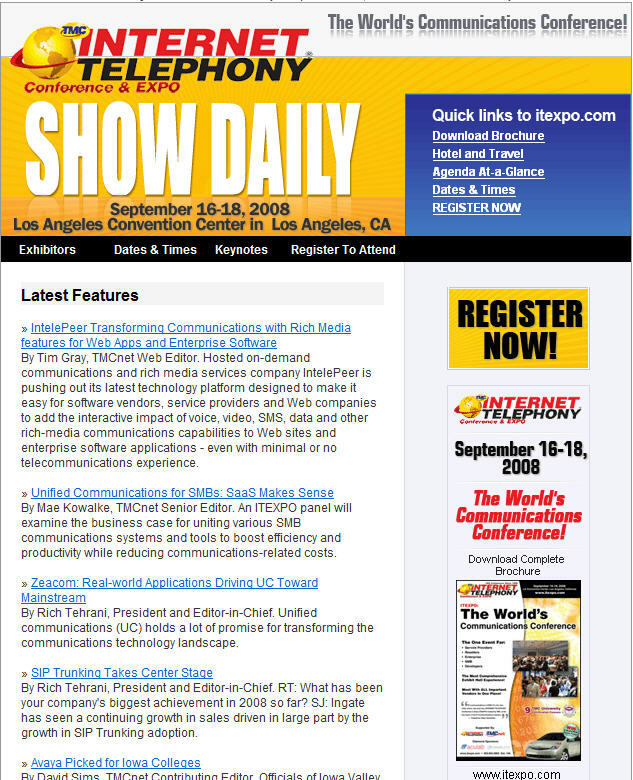 I have been looking at the show directory for next week's Internet Telephony Conference & Expo and am very happy to report this event will be one of the best we have produced. When I saw the draft of the directory on the way to the printer I immediately asked my team to have it turned into a PDF so everyone can see it in advance. Most of the links below will get you directly to the PDF which is 17 MB in size so please don't download over dial-up or wireless where you pay per minute. My show letter is a great place to start as it gives you the details of what is happening at the show. 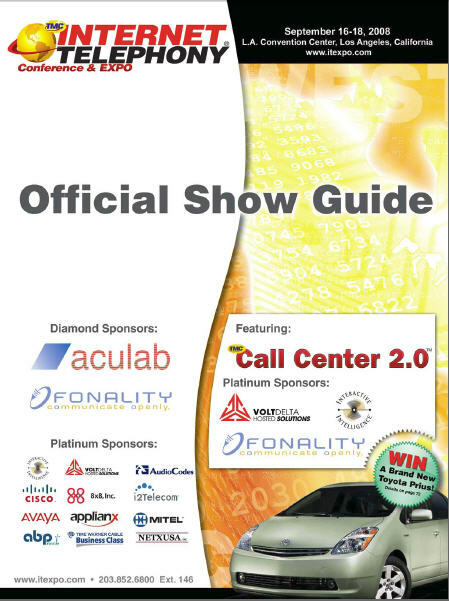 All the top names are in the show... Cisco, Avaya, Time Warner Cable, Mitel, Interactive Intelligence and Dialogic. In addition, the most important open-source communications companies will be exhibiting. One of the most fascinating advances in political systems worldwide is the advent of technology like blogs and other web 2.0 initiatives such as social networking and video. But even the old technologies like SMS are coming into play as candidates look for any and every advantage to distance themselves from one another. As you can imagine, with so much technology swirling around, making candidates more productive and efficient, we at TMC became mezmerized by it all. It got so interesting to us in fact we decided to categorize all of the stories we ran having to do with election technology. Afer a while we realized we had developed an entire website focusing exclusively on election technology and how it transforms poltics. I made a logical leap in my headline -- inferring you can get famous -- in this case, written up in Popular Science Magazine if you come to TMC's Los Angeles ITEXPO conference in just over two weeks. Let me explain. About a year and a half ago, Ari Zoldan, CEO of Launch 3 Communications -- a company installing global WiMAX networks came to ITEXPO and won an Toyota FJ Cruiser at the show. Now he seems to be popping up everywhere. I just read an article in Popular Science Magazine (a great pub BTW) where Zoldan in his new capacity as CEO of Quantum Networks, LLC explains to inventors the best way to go about getting VC money from a firm like his. A few points to consider are -- call the CEO directly and don't give up majority interest. Here is the article (look to the right side of the page). Oh, and in just over two weeks, ITEXPO will be in full force and this year we are giving away a Toyota Prius to one lucky winner. If you thought the battle for the newest computer input method was between gesture-based, keyboard, speech, etc -- you would be missing out on one of the more recent advancements in computer input which is being used by the disabled. And that would be your tongue. Using a magnet and sensors, disabled people can communicate quite well with a computer. I spent some time watching my tongue move in a mirror as I imagined the potentially infinite ways the tongue can move. It is quite possible that the tongue could become a more common method of input but then again, the idea of connecting a magnet to the tip of your tongue is probably not so appealing to the masses. What is the future of communications? One acknowledged thought leader in our field is Thomas Howe and his consulting company which bears his name is the place you go when you want to know. Howe and I were recently on a panel together at a conference in San francisco and I was very impressed with what he had to say so I invited him to be be my guest on a podcast. Some of the takeaways from our discussion are that voice mashups are becoming more common and voice will transcend CEBP or communications enabled business processes to the realm of the consumer as well. As this happens, communications becomes the condiment to virtually all applications. The excitement here is how this will happen.